HomeThe Week in ReviewChip Buttie! What you shout after just 6 weeks and you have gone back to your roots and on the chip butties, or as you might say at least for one of us it might have been a vindaloo, but No we haven’t gone English just yet, not that a chip buttie was one of my things but I know for many it’s an absolute delight. Wed 10/2/16: Return from carnival and we had in our head to have lunch, getting off the bus in Vejer at the top and then do the descent back to camp for our last night. 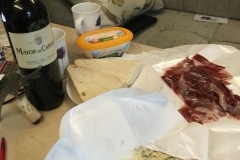 As ever though best plans went astray and the very nice pizza place we had in mind was shut for lunch time and in fact as it was raining and had been for a while it seemed like Spain had shut, a bit like England in an inch of snow. So we headed for as we call it trendy restaurant where we had been for lunch with our friends and had again the little burger but for me the fish of the day, which again I have no idea what it was. Not a pretty fish for sure and slightly odd thing to say but quite fishy, but not in an ‘off way’. 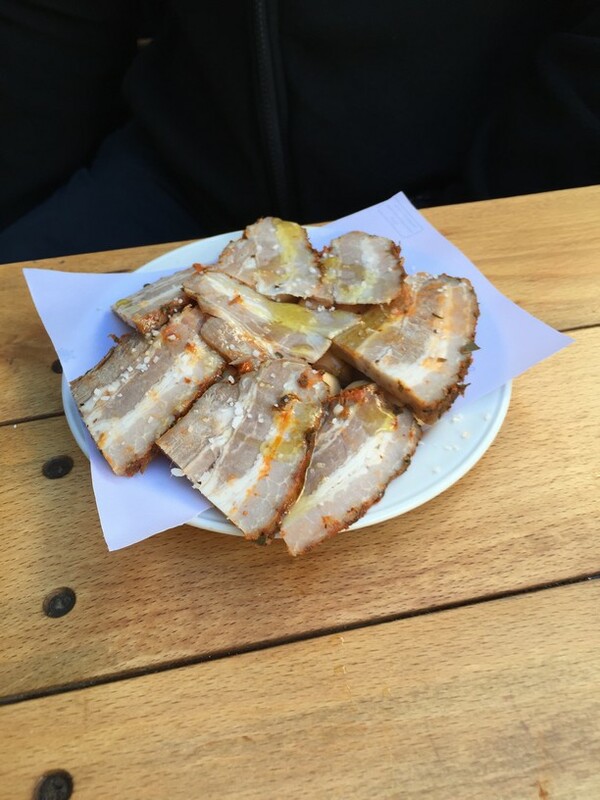 It was delightful and came with a very small portion (amongst others things) of warm pickled garlic, we think it was pickled, but it really was very tasty and we could have had more of that. Again the treat place and so chocolate cake to finish. Thurs 11/2/16: Leaving our home for a month Vejer and on to Seville, so after goodbyes at the campsite to Miguel, Eva, and Willy we set off stopping at our favourite bar on route to have a café con leche and say goodbye. Sad for us as this place had been very good and kind to us and we loved the people there and I think for them they had also got use to us in a strange way as well. And so we hit Seville with mixed emotions, we had loved Cadiz but everyone raves about Seville- was it to be that moment of disappointment for us. Thankfully not, we arrived and loved the aire we were staying at which was on a canal just outside the main town and after heading into the main city we fell in love with that as well. Different from Cadiz in so many ways but each has its own thing to offer. We had a lunch of tapa and for the first time tried the steaks which are small minute ones in a variety of sauces. I had it with Roquefort sauce, again we had garlic potatoes and also meatballs. I can’t say enough about the greatness of these small dishes where you can try so many different tastes and just have that small nibble with your drink as you go, and then another nibble at the next place that’s not crisps or peanuts. Fri 12/2/16: Food tour day and this probably needs a whole blog in itself but having left this quite a while I will keep it short. 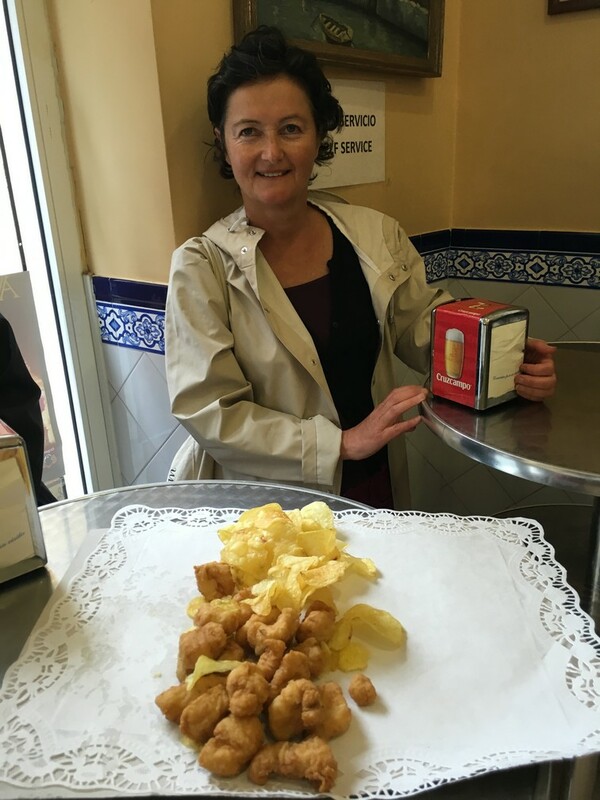 A leaving gift for me was a food tour in Seville and so we opted to do this early in our visit, for once sensible on our part as we could then go and visit places again that we liked and it would orientate us around the city. We caught the bus early in the morning and it reminded me of home and going to work, unfortunately I didn’t know the Spanish for ‘can you move along the bus please’ so had to leave it to David to push his way down among the morning workers. We were then meet by Jamie of Devour Seville and my heart sank as he was Irish. 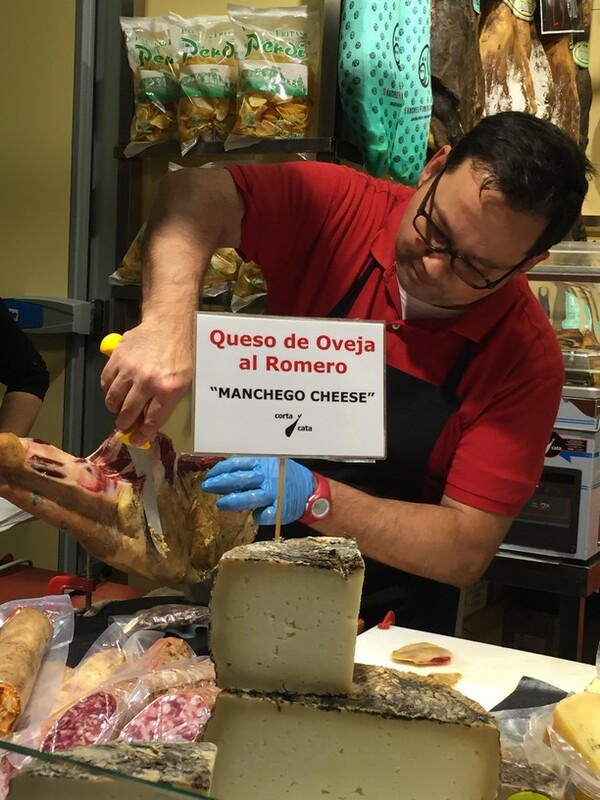 Would we get to know anything about the food and culture of Spain once he and David started, but after a few dirty looks on my part we headed off and all was good. First stop for breakfast and a princha, which we have seen on most menus but not tried but after this tasting we will be- it is in fact left over stew which they fry up and then put into a small hot roll and generally have it for breakfast, a delight for me and I could see myself having that for 2nd breakfast a few times!. The tour had many highlights and they also included cultural and historic facts as well. 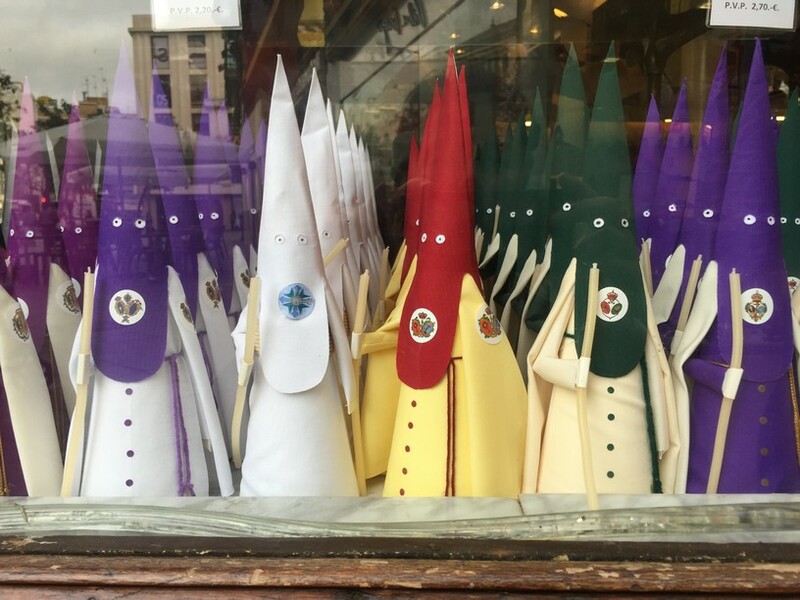 One of the delightful stories was that about Semana Santa (Easter) and thankfully Jamie supported us on not being in Seville for Easter as it’s just to busy, amazing but unlikely for us that we would get full benefit out of it. But as they are already ‘revving’ up for it he told us quite a bit about the traditions of it and we stopped outside a material shop briefly where he said the ladies of Seville are already getting their flamingo dresses made up for the fair 2 weeks after the actual Easter parades. Like any wedding or christening at home you really can’t be seen in the same dress as someone else, nor the same dress in the 4/5 days of the fair, so at the moment all the dress makers are very busy mixing and matching materials for flamingo outfits. This applies to old and young, rich and poor, you must be seen in these clothes over this period one way or another. I was thinking perhaps a punk style with a few rips in the dress or even a Liz Hurley and that safety pin option! For the actual holy festival the women still dress in black veils and have their hair pinned in a set fashion that is piled up under the veils and they walk for hours in very high heels in the parades, no trainers on show on these occasions. What about the food you cry and the chip buttie and it was later on this tour we had this delight. It is in fact a traditional and local sandwich here and is pork steak in a secret sauce that did include mustard and whiskey and then is served in a hot roll along with patatas- huge and for David heaven. For me, although I could get the delights of it was way too much and would be a share or a brunch option. Another delight of the trip was a small and old bar called Taberna Peregil where we had orange wine, the history of the place being that the original owner was a flamingo singer of note and very handsome as well. Singing was encouraged still in there but none of the younger family members had inherited any singing talent. 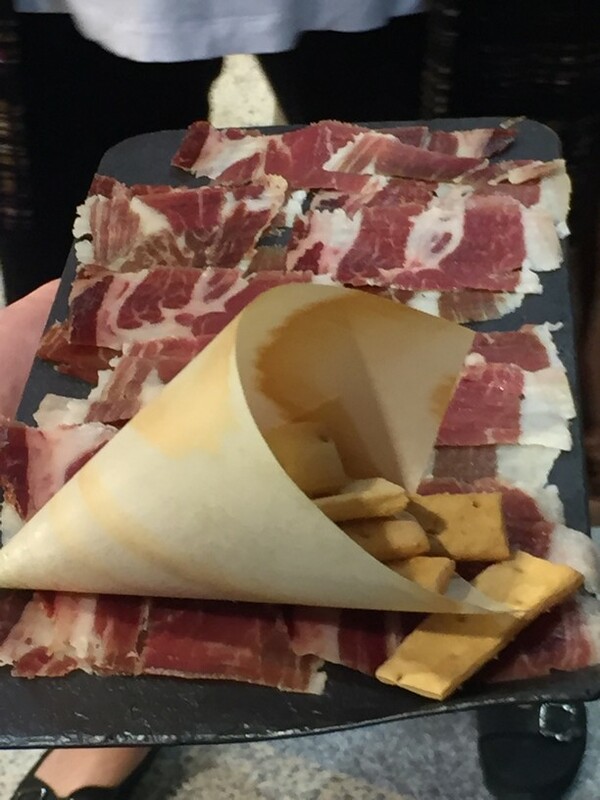 It was a great tour and we saw and tasted a lot, worthwhile doing if in Seville, Madrid or Barcelona for sure. We rolled home very happy and did indeed re- visit some of the places. Well in fact the first once straight way as David had left his bag there!! 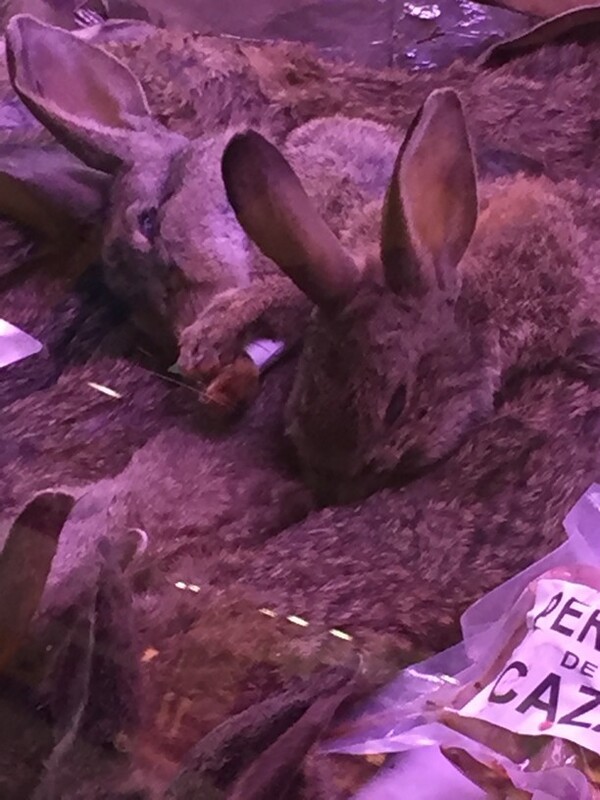 Our furry friends on sale in the market. Sat 13/2/16: Headed to the local market and to meet another couple from the food tour and a great long, lazy lunch of tapas was had. 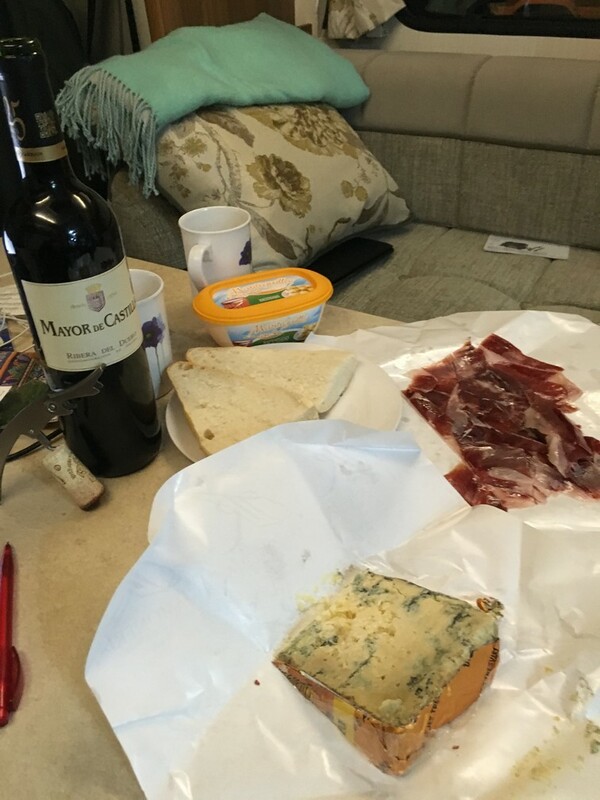 My choice for that day food wise was the cheese and jamon we brought from the market- the jamon was again melt in your mouth stuff and was the black footed piggy that is acorn feed and the cheese a very strong blue. Both lovely and just a simple end of day supper that oddly cost more than us eating out!! Sun 14/2/16: Valentines days and not an overpriced menu to be seen. A day around town and the Alcazar in slightly cloudy weather again so the gardens weren’t open there which was a shame but didn’t deter from the splendour of the building itself. We went to a ‘trendy’ restaurant that had been recommended on the tour. Not visited but recommended for staying open all the day and good for food. The food was fine, no complaints there at all but I just wouldn’t go back, but by the same token I wouldn’t say bad things about it- it just didn’t do much for me on that day. Mon 15/2/16: We made it into the cathedral, a great place and worth a visit as these places usually are. 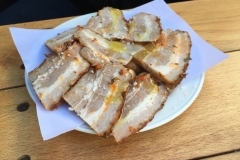 Top food choice of the day- Chicharron de Cadiz. These we had after the cathedral visit in what we call the orange wine bar, because as per earlier it’s where we had the orange wine but of course they do tapa and this one was recommended – thinly sliced cold pork belly with salt and smoked paprika but I’m still not doing it justice, how it might have been roasted I’m not sure but it was a standout favourite for us, along of course with a glass of orange wine and a quick outburst of some flamingo singing by the locals not us! Tues 16/2/16: We hopped on a bus and went into the suburbs of Seville to visit a roman ruin called Italica. The roman ruin was a poor man’s relation compared to the one in Bolonia in terms of set up but not age as this one was much older, but seemed to lack the money that had gone into the Bolonia one but it was a wonderful site and very atmospheric as well. A great bar opposite where we had 2 tapas- a melt in mouth beef stew and a ratatouille like vegetable affair, both lovely and for once eaten in a full blaze of sun. We ate locally that evening and after seeing many habas growing we found some to eat. They certainly weren’t this year’s crop as they were way to big so would assume last year’s that had been stored. These were served hot and with some jamon and then with a fried egg on top- a step too far for David, but I really enjoyed the dish, breaking the egg through the beans and the jamon- I’m a big broad bean fan so for me I hope the first of many and if they involve fried eggs all the more for me as well………. Over and out now as I have a sherry tasting to prepare for. Things don’t get much more authentic than local songbirds doing that crazy Flamingo singing. Taste buds salivating. Planing to spend a long time in Spain and Portugal from November 2016 …. not sure how my weight will cope though! 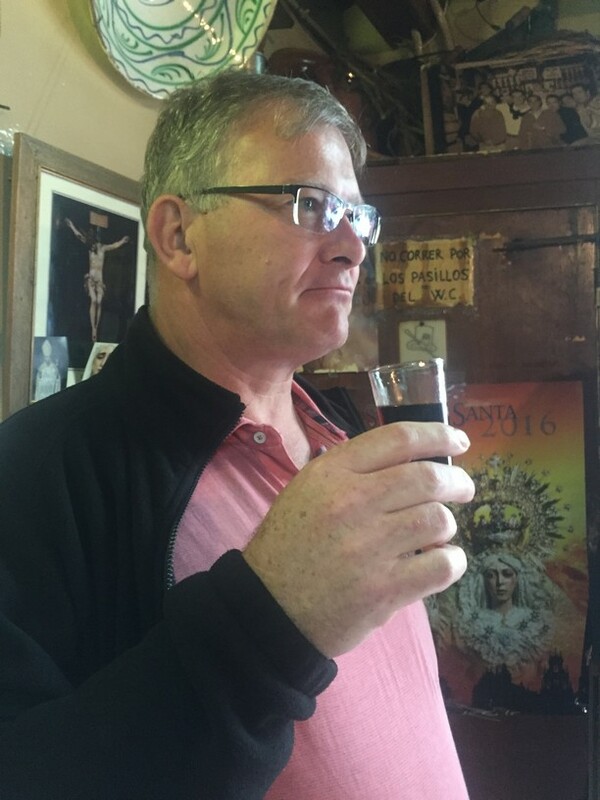 My favourite Sherry is Matusalem Oloroso …hope you get to try some – great after a meal.